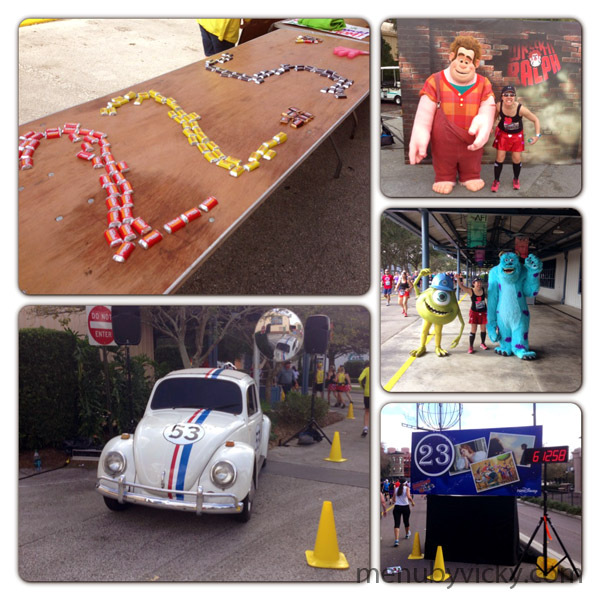 The second day of the Goofy Race and Half Challenge started at bright and early at 2:20AM. Originally, the plan was to be up by 2:00AM like I was for the half but I ended up hitting the snooze button more than once. Getting up that early is tough but getting up for 2AM twice in a row, on four hours of sleep was especially tricky. But I managed to get up, shower, dress and eat my breakfast. 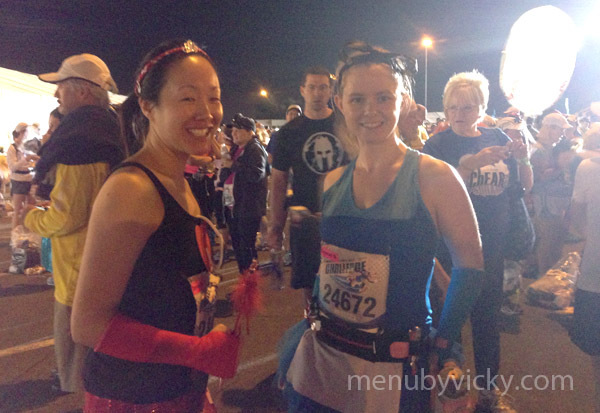 I was out at the bus stop by 3:30AM, I boarded the bus and headed over to the pre-race start area to meet Rebecca and Robbie. Today, Rebecca and I were doing costumes again – we were Alice in Wonderland and the Queen of Hearts. The three of us met up, dropped off our gear in the bag check tents and started to make our way to the corrals. After the slow walk yesterday morning, I wanted to make sure we had enough time and weren’t rushing. I decided to skip the porta potty lines before bag check and figured I’d find one by the corrals instead. Unfortunately, it seemed like everyone else had the same idea making the porta potty lines near the corrals REALLY long. I wasn’t in the mood to line up so I grabbed Rebecca and she was nice enough to “stand guard” while I ran over to the bushes. Hopefully, no one had their cameras out. After that, we headed back to the corrals to wait. The start of the full began with the singing of the national anthem, fireworks, a send off for the wheelchair athletes, followed by runners in Corral A and then it was our turn in Corral B. We were off! 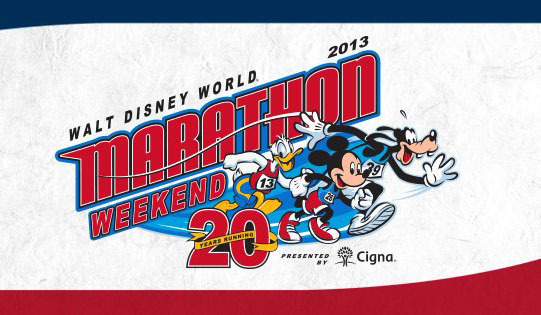 To celebrate the 20th anniversary of its marathon, Disney introduced a new course that had runners going through Magic Kingdom, Animal Kingdom, Hollywood Studios and Epcot as well as the Speedway and the Wide World of Sports. There was also the promise of a special surprise at mile 20. Robbie, Rebecca and I decided to keep our run/walk intervals to 3/1 and the first five miles of the race went smoothly. Because Rebecca and I were dressed as Alice and the Queen of Hearts, we were on the look out for characters from ‘Alice in Wonderland’. 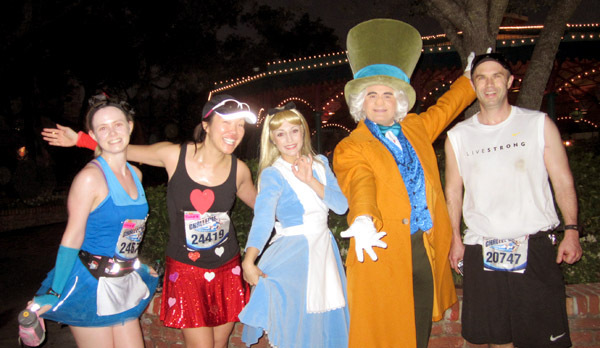 After running into Magic Kingdom, we spotted Alice and the Mad Hatter just outside of Fantasyland. The three of us got our photo and were on our way again. Just outside of Cinderella’s Castle, Robbie said he wanted to take a photo with Mickey and Minnie. This was one of the longer lines and Rebecca and I decided that we would run ahead and meet him after he was done. We made stop in Frontierland for the bathrooms and Rebecca and I grabbed a picture with Bullseye from ‘Toy Stoy’. We waited a few minutes but didn’t see Robbie. We thought he might still be in line at the castle and decided to run ahead, hoping he would catch up with us. We continued through Magic Kingdom’s backstage area and headed out on the road toward the Grand Floridian and Polynesian resorts but there was still no sign of Robbie. I’d send him a text every so often to let him know where we were. 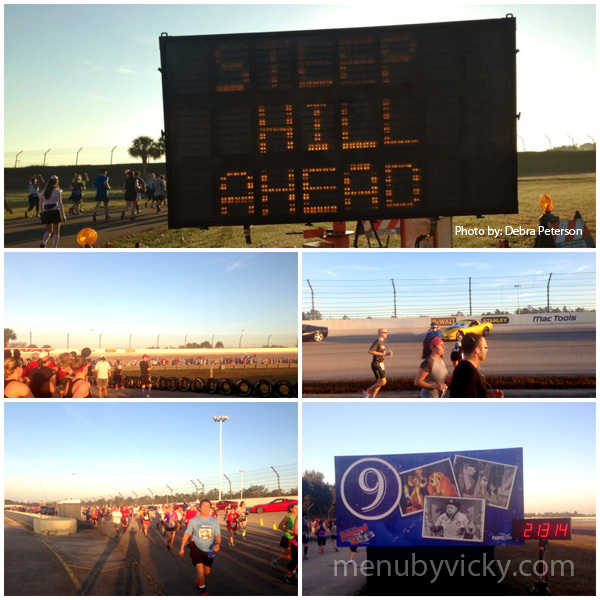 At mile 8, we made a turn and headed toward the Speedway. Disney had placed a number of classic cars out on the racetrack along with the characters from the movie ‘Cars’. 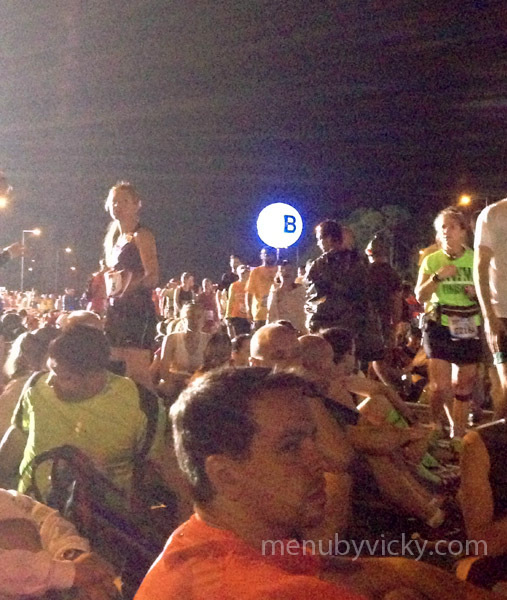 Though there had been concerns about the banking on this part of the course, Disney kept runners on the flat part of the track. In fact, it was easier to run on the Speedway than it was on some of the highway on ramps on other parts of the course. Just before we reached mile 9, Rebecca and I spotted a familiar face! Robbie had caught up with us! 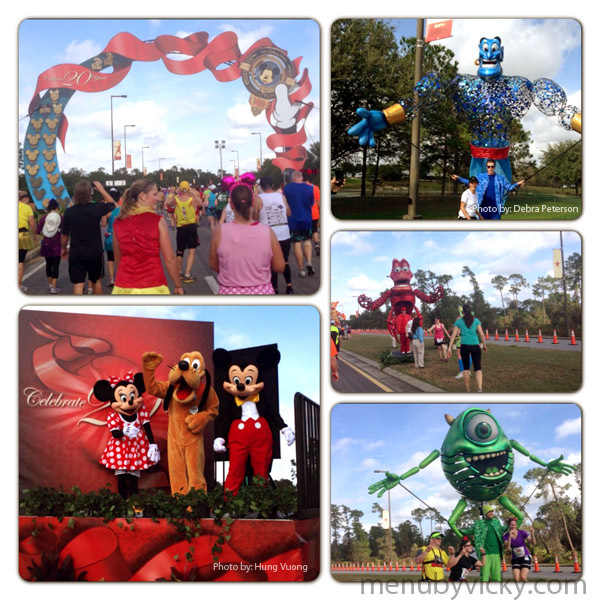 Miles 10 to 12 would take us down a road toward Animal Kingdom. This part of the course was shady and cool and I was happy to be out of the sun! There were a few character stops here – the Disney villains, a Christmas scene, Peter Pan and the Country Bears which I had to get my picture with because I’m a fan! By the time we made our way into the backstage area of Animal Kingdom, the sun was out and it was starting to get toasty. I was glad that Robbie had suggested early on that we stop at each water stop and drink a water and Powerade. It would have been easy to dehydrate with the temperatures and humidity as high as they were. While running through the backstage area, we came across a few WISH’ers – Matt and Jenn. We got to run with them for a while but got separated after we made stops for pictures with characters. 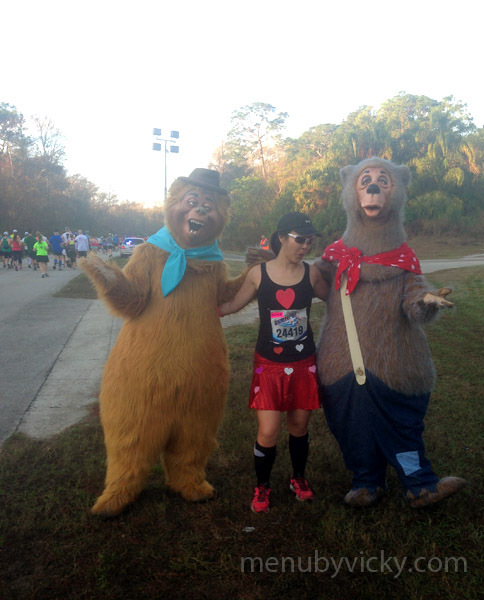 I took one with Baloo and King Louie from ‘The Jungle Book’ and I also stopped for a picture at the mile 13 marker. 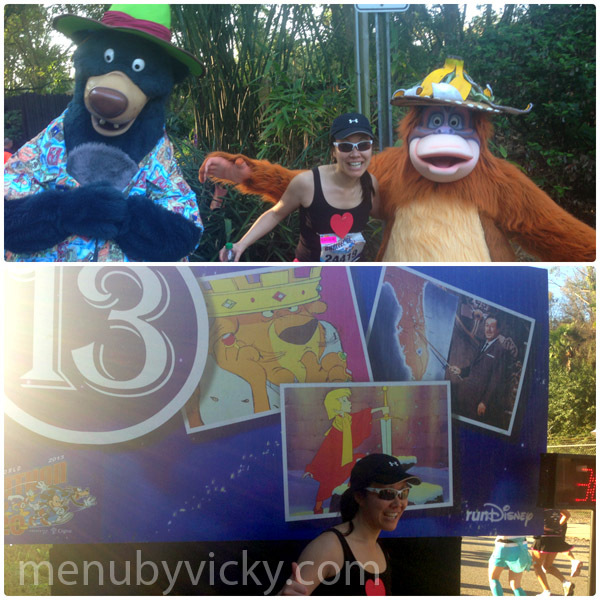 We passed Expedition Everest and noticed a line of runners waiting for the ride to open but decided we’d keep going. 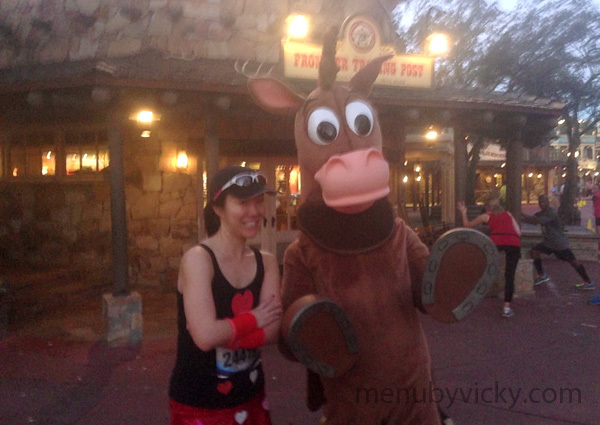 Shortly after reaching the front of Animal Kingdom, Rebecca said she was having knee pain and that it hurt to run. The course outside the park was quite narrow – maybe three people wide and there was no way for us to stop. So the three of us walked for a few minutes before we were able to find a bench we could sit down on. I wasn’t really sure what I could do to help out nor was I sure where the next med tent was. As we sat on the bench, a Japanese lady on the spectators’ side of the course waved to us. She had an aerosol can and motioned that we could spray it on Rebecca’s knee. The only word on the can in English was the word ‘COLD’ so I could only assume it was Biofreeze in aerosol format. I brought the can back to Rebecca and Robbie and explained what I thought it was. Rebecca was reluctant to try it – I wouldn’t want to use it either without knowing what it was. We sat for another few minutes before the lady waved at us again and pointed at Rebecca to come over. I asked if she could come over to us but she couldn’t so Robbie and I walked Rebecca over. Through a series of gestures, we were able to explain that Rebecca was having knee issues. She sat Rebecca down on the grass and proceeded to give her a massage. I was completely surprised! Of all the places we could have stopped during the full, did we EVER luck out! After several minutes, Rebecca said she was good to go. We thanked the lady and headed on. 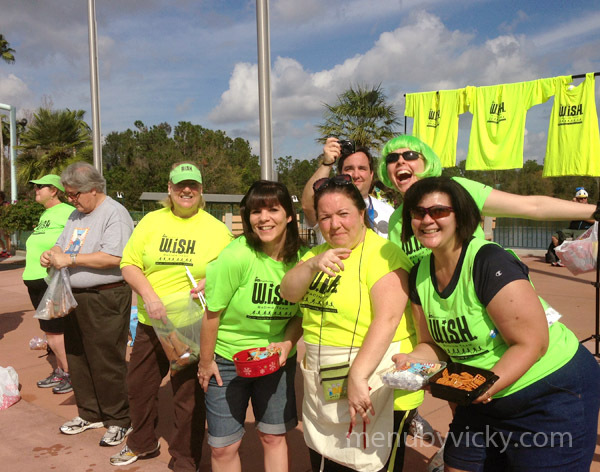 Next, we came across the WISH scream team just before the bus stops at Animal Kingdom. This was an informal aid station that my running group WISH had set up. They were a welcome sight with licorice, pretzels, cold wash clothes and lots of encouraging words! I grabbed one of each and the sugar from the licorice was exactly what I needed to keep going! We continued on through the parking lot where Robbie stopped for the characters from Camp Minnie and Mickey. Rebecca and I continued on, passing mile 14 and onto Osceola Parkway. 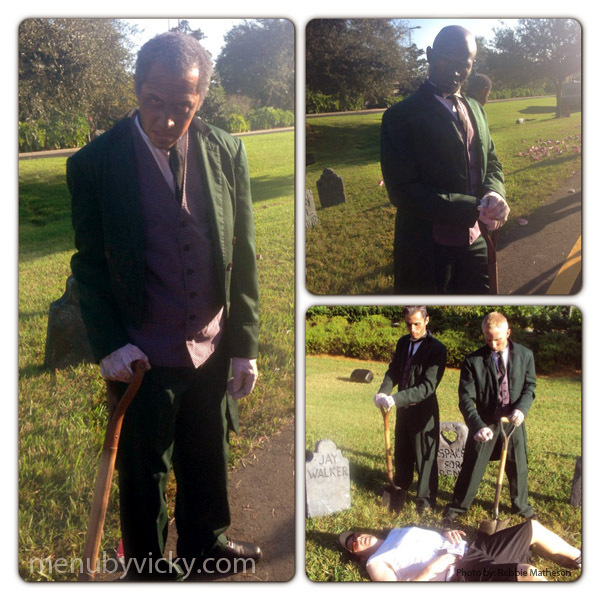 We passed the gravediggers from The Haunted Mansion where you could take a picture lying down in front of gravestones. The line wasn’t too long but I didn’t want to leave Rebecca so I grabbed a picture with the gravediggers by themselves. Robbie caught back up to us just before the exit ramp for the McDonald’s on Buena Vista Drive. He had actually stopped for the Camp Minnie and Mickey and a photo with the gravediggers as well. Did I mention he was fast? I joked and asked if he was going to go to McDonald’s and get us McFlurries. I found the trek down Osceola Parkway difficult. The sun was unrelenting and there was almost no shade on this section of the course. Maybe I should have gotten that McFlurry. It was a long three miles but eventually we reached mile 17 and the Wide World of Sports. I was happy to see lots of spectators in the complex and Robbie was great at running ahead and getting the crowds to cheer on Rebecca! 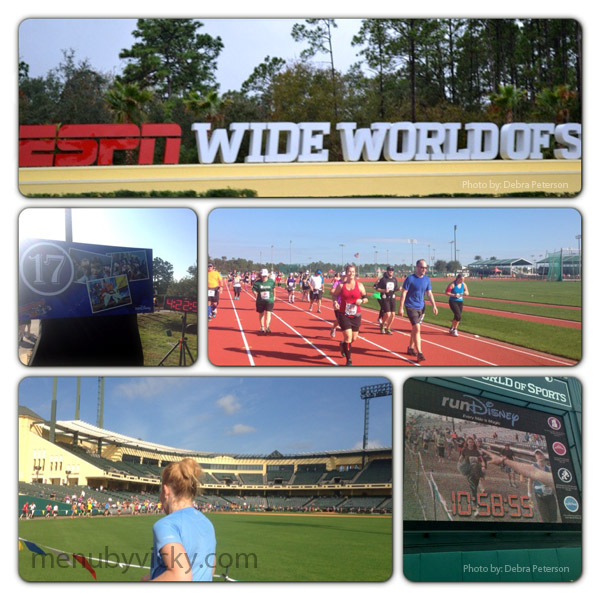 We also got to run through a baseball field – similar to the set up at the Disneyland Half. I spotted Anne sitting in the bleachers and she gave me a big smile and a few orange slices and sent me on my way. I loved that we got to see ourselves running on the jumbo screen TV. Very cool! The final stop in Wide World of Sports was the mile 20 spectacular. There was a lot of build up to this surprise so I wasn’t sure what to expect. Disney had several live puppeteers with characters such as Genie from ‘Aladdin’, Sebastian from ‘Little Mermaid’, Mike Wazowski from ‘Monsters Inc.’, and a stage with Minnie, Pluto and Mickey. I loved the music playing but overall I found the whole experience underwhelming. Surprise! There was no surprise? I didn’t stop for any photos because the lines were long and I was just looking to finish at this point. 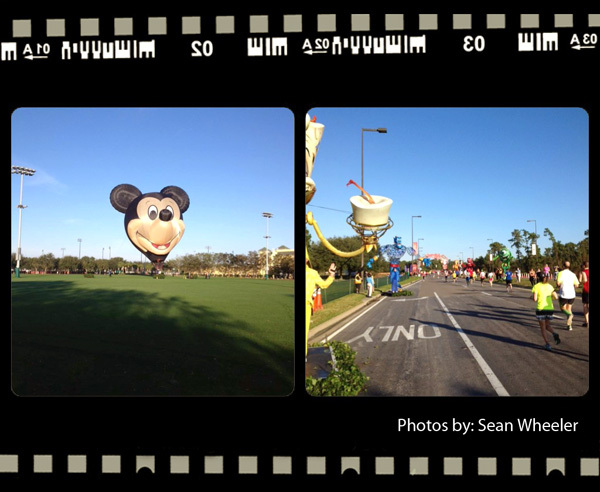 If you were fast or in one of the earlier corrals, then you also would have seen the Mickey hot air balloon. Sadly, it wasn’t anywhere to be found when the three of us passed through. We exited the Wide World of Sports and headed back toward Hollywood Studios. This was another one mile stretch back out in the sun – funny how long a mile can seem in the heat. 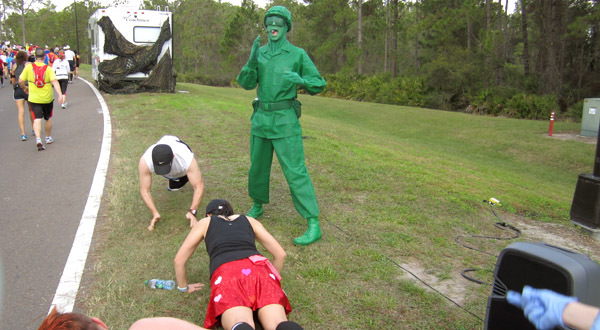 At mile 21, we came across the Green Army Men from ‘Toy Story’ and Sarge was looking for push-up volunteers. Robbie and I raced up and did 10 push-ups each because at what other race can you say you got a chance to do push-ups! The next two miles would take us into Hollywood Studios and past the Hershey chocolate stop. I loved how the volunteers here had arranged the chocolates into their own mile marker. We also stopped for pictures with Ralph from “Wreck it Ralph” and Mike and Sully from “Monsters Inc.”. And just before we ran up the streets of New York, Rick and Kimberly had caught up to us! They had started in a different corral so it was exciting to see them! The five of us headed through the streets of Hollywood Studios and out into the park entrance where we came across the second WISH scream team. Kathy, Suzanne, Corinna, Maria, Jeanne and Kipp were all there to name a few! They had more treats like pretzels and cookies and frozen washcloths which felt amazing! Did I mention it was hot? The awesome and amazing WISH’ers outside of Hollywood Studio! We stopped briefly for a picture and continued on our way through the Boardwalk, Yacht Club and Beach Club resorts and back into Epcot. Robbie ran ahead to England, grabbed a beer and waited for us to catch up. 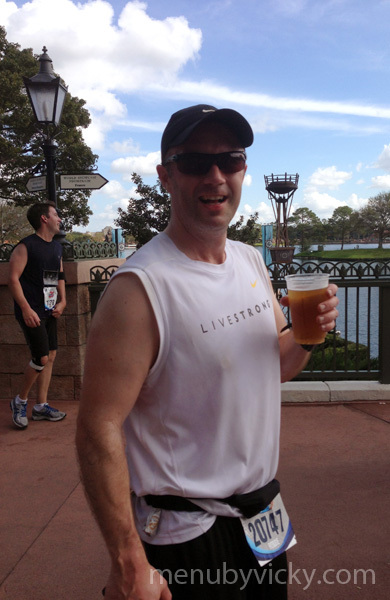 Robbie in Epcot – Drink around the world starts early! We ran into World Showcase – through England, France, Morocco, Japan, America, Italy, Germany, China, Norway and Mexico – and after passing the gospel choir, I knew we were in the home stretch. We did make one last stop for photos with Mickey Mouse in his runDisney gear. I crossed the finish at 7:00:13. Robbie, Rebecca and I took one more group photo! Then we headed to the med tent for some ice. For those of you curious, the med tent has ice, bandaids, Tylenol, Biofreeze and medical personnel. I was worried about Rebecca’s knee but she iced it and seemed to be okay. After the med tent, we were off to get our Goofy medals, water and food boxes. I was curious to see whether anyone would be checking our finish times before we got our Goofy medal but no one did. 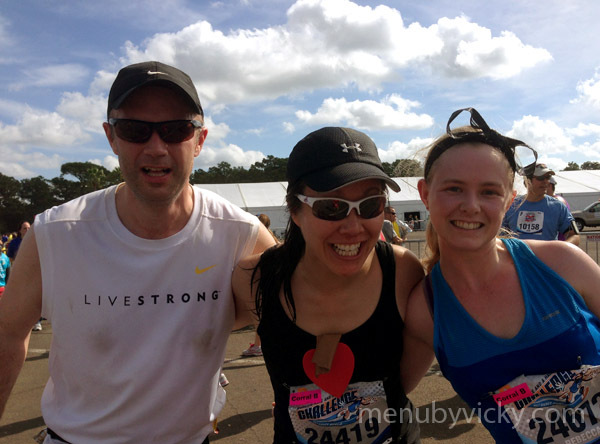 Robbie, myself and Rebecca after crossing the finish! My Garmin was DOA after crossing the finish but honestly, I could have cared less about time that day. I have never had as much fun during a race as I did Sunday! We stopped for character pictures, did push-ups and Robbie and Rebecca were great at getting the crowds to cheer for everyone! I liked running through the Speedway and checking out the cars. The volunteers at the aid stations were fantastic and I loved seeing all of the WISH’ers out scream teaming, on course running or at the end waiting for everyone to get in! These are a few of my favorite pics! A few of my favorite pictures! Time? Who cares about time or a PB when you’re having this much fun! 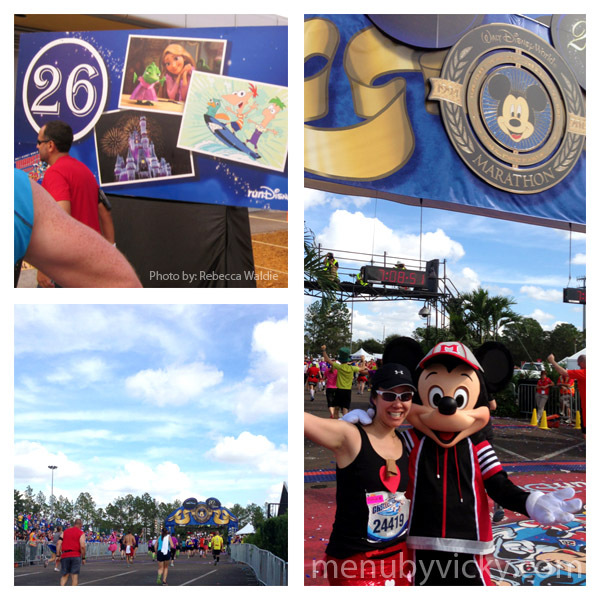 I wasn’t sure whether I’d like the new changes to the course – the changes had us hitting the parks earlier and the 8 miles were identical to the half. But I didn’t mind the similiarities to the half, the Speedway nor hitting the parks earlier. But I know people who wanted to ride Expedition Everest had to do a bit of tweaking to their plans to make sure they ran through the park when it was opened. And while I’d like to see the Speedway stay for future races I could go either way on the Wide World of Sports. One thing I could have done without with was the intense heat and humidity – I got sunburned across my neck, chest and arms which made it difficult to sleep or even wear my medal on Monday. The mile 20 surprise was a bit of a let down. Perhaps I was too hot to care at that point but I think it had been over-hyped. And while I liked the food boxes at the end, I wish the box had a little more food it in. This was the same box that we received yesterday for the half and the same one that was given out after the 5K. 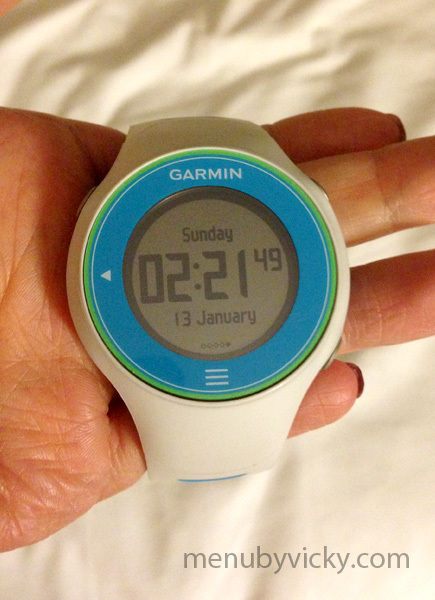 There you have it – 39.3 miles over two days! Two races and three medals! 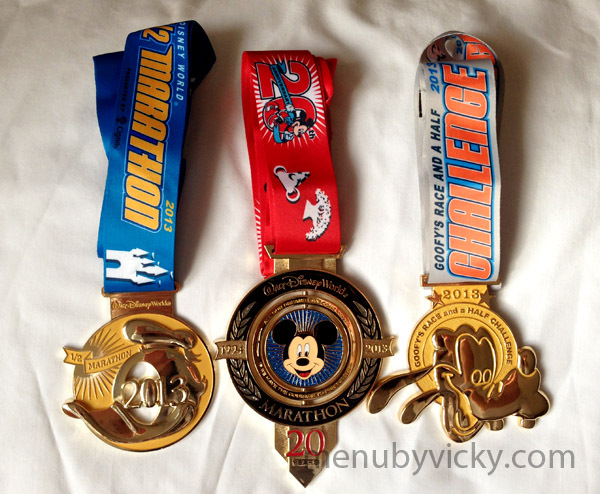 Would I run Goofy’s Race and Half Challenge again? Absolutely! Big thanks to Rebecca, Robbie and Rick for letting me share in their first Goofy race and for putting up with me on Saturday and for more than seven hours on Sunday. You guys are awesome! Congrats on a fantastic finish, especially on such a hot day! I hope we can all run another race again sometime soon! 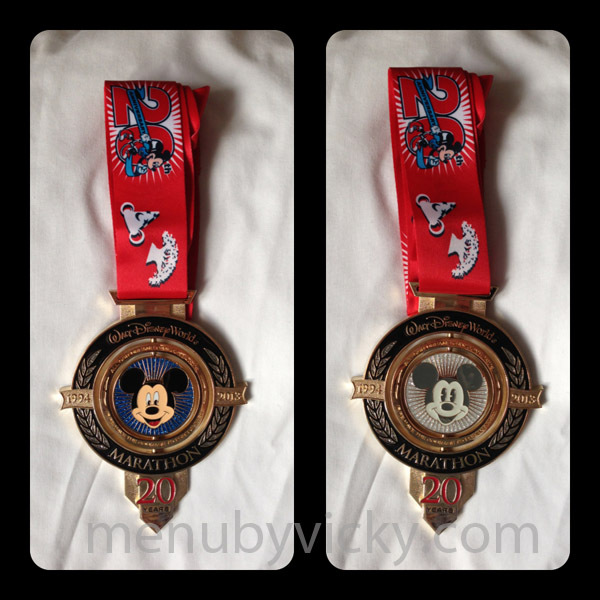 The medals for the half and full Disney marathons and Goofy. We went in 2011 to Disney but am in England, so it’s a bit of a trek. One day we’ll go back! That was a lot of fun reading your race report. Lots of detail and plenty of photos makes a reader imagine they were running the race with you. I wouldn’t care about time either with so many attractions and characters to capture. Running on the banked track, Jumbotron, and impromptu massage were nice touches. Can’t wait to read your 2014 report! Wow! Thanks again for detailed recap. I felt like I was there in person! 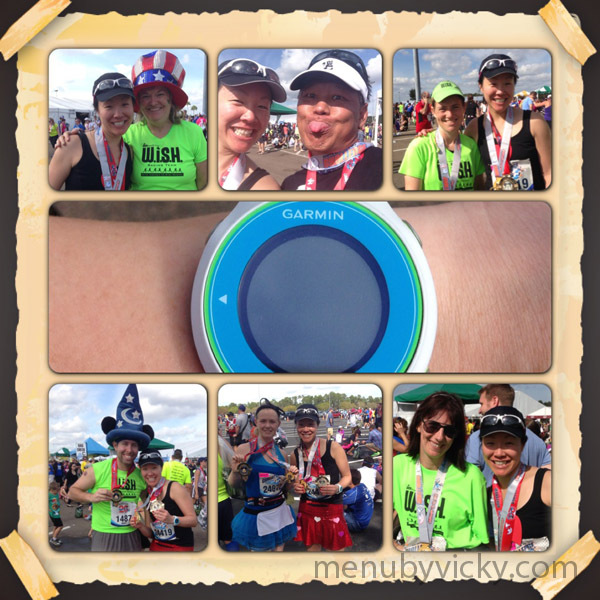 I think I need to start doing more exciting Marathons! I have put the Medoc one on my list which is a marathon through wineries in France! Thanks Jackie! We’ll have to do a marathon together one day 🙂 Medoc sounds awesome! Do you get wine afterward?